Salsa Eating Salsa: Flavor machine! Mom sent me and Deb 7 qt. Le Creuset ovens for Chanukah-- sweet! It's amazing-- the heft and the enamel finish work wonders, and it's easy to clean. 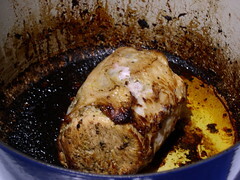 I made a pork loin last night-- marinated it, browned it on the stove, then poured the remaining marinade in the pot and put it in the oven, covered, for ~:40. It came out like this-- I was worried about the thick crust baked onto the enamel. But after removing the meat and pouring off the fat, it deglazed perfectly with a little chicken stock and red wine and made my most succulent pan sauce yet-- it wasn't a burned crust but a build-up of tasty fond.